Brownsburg, Indiana is a town in Hendricks County, about 15 miles from Indianapolis. James B Brown was the first settler in 1824 in Brown Township, a wilderness that only trappers and hunters lived. In 1835 the town was established when William Harris sold land to pioneers, and the town was originally called Harrisburg. The name was changed to Brownsburg because there was another post office in the county with the name Harrisburg. Stagecoach lines kept the communities in the area connected, and when the railroads began to be built, growth was the natural result. This historic town has a population of approximately 25,410. Although not a large city, this lovely town has some fun things to do. The Arbuckle Acres Park has lovely trails for a leisurely walk, playground for children, and different sports fields. The Brownsburg Bowl is a popular place with 28 bowling lanes, a lounge, and game rooms. The Brownsburg Golf club has a beautiful course to enjoy some outdoor activity. There is also the West Chase Golf Club if you are ready for some time in the sun. The Hauntsburg Haunted House, founded in 1848, is considered one of the scariest of the many haunted houses found in Indiana. The racing enthusiasts will find the O’Reilly Raceway Park a legend featuring much of the best racing outside of Indianapolis. Real estate in this historic city offers a variety of styles. There are older homes in the ranch and bungalow styles, as well as multi-level homes and split-level homes. New neighborhoods have been developed with more contemporary homes, many large homes on large lots. There are also condominiums available in the city. The area is low in crime and the schools have high ratings. Many consider it a perfect place to raise a family, and there are additional shopping and entertainment opportunities in nearby Indianapolis. There are those who commute to Indianapolis for work, but enjoy the small town feel of this historic area. 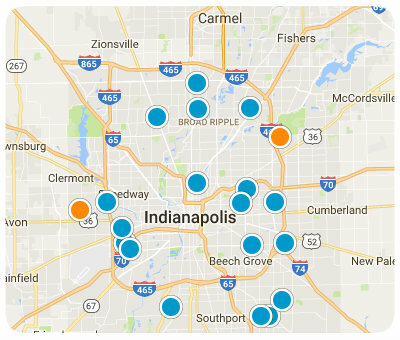 When you consider all these factors, then this becomes a must-consider destination for home buyers searching in the Indianapolis area. If you would like more information on homes for sale in Brownsburg, Indiana, please contact us today and allow us to assist you. Listing courtesy of Bowman & Associates, Llc.